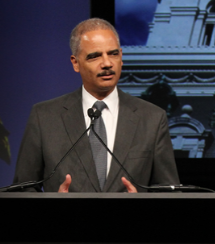 Apparently not all the federal prosecutors are on board with Attorney Gen. Eric Holder’s views on drug laws. Retired attorney Paul Mirengoff writes on the website POWERLINE that hundreds of career Justice Department lawyers ” have broken into open revolt against Attorney General Holder over his support of legislation that would drastically cut back on mandatory minimum sentences for drug pushers.” The legislation Holder supports is known as the Durbin-Lee bill. We believe the merits of mandatory minimums are abundantly clear. They reach to only the most serious of crimes. They target the most serious criminals. They provide us leverage to secure cooperation from defendants. They help to establish uniform and consistency in sentencing. And foremost, they protect law-abiding citizens and help to hold crime in check. Posted: 2/2/14 at 12:26 PM under News Story.